Every year I set myself a target, usually of about 100, of films to watch. These are new films. Not new, new films. But films that are new to me. Any time I’ve seen a new one, I post a bit of a brain dump of my thoughts on the film here. Enjoy! I do believe this will be the end of my mediocre film streak. Well, I hope so. If anything, it’s a brief pause. 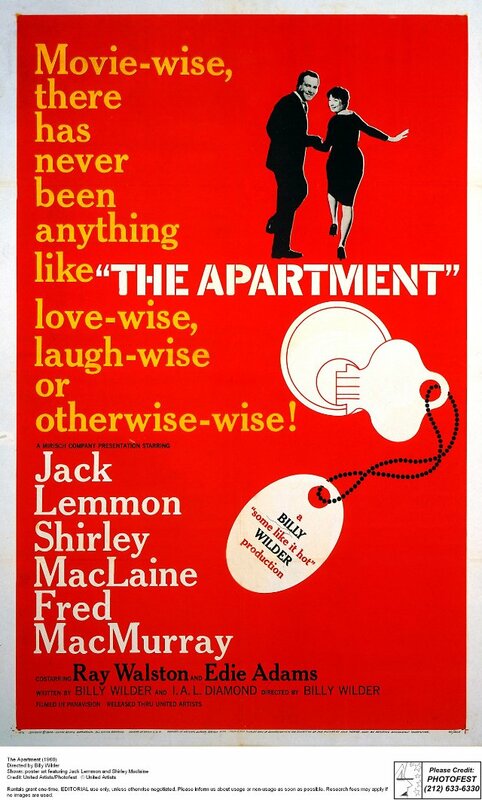 The Apartment was one of those films I hadn’t actually heard of until this year. For shame. Though, in my defence, my historical film knowledge. Something I’m working on right now. So yay me, okay? I can’t think of any other way to put this, but this film is adorable. Jack Lemmon’s C.C Baxter is the perfect gentleman. In some ways, I found his perfect gentleman-ness a little too much. I might have yelled at my TV for him to get himself a spine. But, the film was set in a completely different time. Shirley MacLaine’s Fran Kubelik was adorable. Such a fun character. Endearing. These two characters and actors got me totally engaged in this film. The film itself was the perfect balance of comedy, romance and drama. I was laughing as poor Baxter was trying to make his way up the corporate ladder, all the while trying to placate the neighbours of his apartment. Towards the end, I was worried that Baxter and Fran weren’t going to get the happy ending they both deserved. Usually, I’m cynical and quite open to unhappy endings. But not here. And thank you for that ending. I wish all romcoms had this much charm in them. A very enjoyable movie and nice to see you thought so as well Jaina. Lemon is such a great actor, love him in almost anything he has been in. I’ve not seen anything of younger Jack Lemmon. So going to try and find some more. Any recommendations are welcome! The Apartment is a lovely film from a gentler time. Glad you enjoyed it. It is! But it gets dark. Darker than I thought it would. But … in a good way. I love this movie and I am glad you enjoyed it so much, too, Jaina! It was a bit darker than I expected but I think that made me like it even more. Definitely darker. I was expected it to be a pretty light affair. That darkness had the same effect on me as it did you. Ahh, really? It looks like everything is working on my end, but I’ll keep an eye on it. BTW, I am still not getting email notifications when you reply to comments on here. I have noticed this happening with other self-hosted websites such as Impassionedcinema, so maybe it’s a bug with the comment system…? I think everything’s sorted itself out now… weird! So glad you liked this one! It’s such a charming movie. Isn’t it great when you finally see something great after long line of mediocre movies? The film feels even better because of that. Yes. It feels brilliant! I feel like sitting through some crap was worth it to get some gold. Seems like everyone’s seen this movie but me, ahah. I have a feeling I’ll enjoy it as it sounds so delightful, I keep seeing people rating it so high! Definitely watch it. I reckon you’d love it, Ruth. “The Apartment” is a really good picture. It’s interesting, it’s a movie with hardly any good, decent characters. But Lemmon is so good in this. Lemmon is excellent. I felt for him. Even, if at times, I thought he was a tad frustrating. I started to watch this, but didn’t expect it to get as dark as it did. At the time I wasn’t interested in finishing it, but I believe I’ll give it another go eventually. Give it another go. Get through the dark and the ending will reward you. It’s a great film. Wow, you are making great progress on your list! The Apartment is already on my list, and after reading your review, I am looking forward to it even more. It’s such a beautiful film. I understand why it’s on the top of so many people’s lists now.